I will close with a famous quotes by Eugene V. Debs, "When we are in partnership and have stopped clutching each other's throats, when we have stopped enslaving each other, we will stand together, hands clasped, and be friends. We will be comrades, we will be brothers, and we will begin the march to the grandest civilization the human race has ever known." Here is the first video from the Latinos in Tech Event at SXSW. Thank you @mlackey for filming and @JulieDiazAsper for letting her use the flip! Over the course of the last decade my involvement with technology and social media has touched my life professionally and personally. However, I have to admit that perhaps the most poignant moments for me personally involving new media revolve around the last few days and the incredible support that I received through the Twitterverse and Facebook when I shared with my followers and friends that my mother had suffered a stroke. I am deeply moved, touched and inspired by the response of everyone who reached out to me through Facebook and the Twitterverse. Thank you. The power of the community that we can and have created in this space is not lost on me. Thanks for making it so real and personal. While we were at SXSW this year, Julie Diaz-Asper and I were interviewed by David Spark on Latinos in Social Media. Reflecting on the fact that one out of every four births in the US is Hispanic David asked us, "If I have four children will one of them be Latino?" We couldn't help but laugh. "It depends on your choices," I said. Good one David. Watch the interview and please comment on his post on tweetshare. Yesterday I was interviewed by One Voice Radio on immigration reform and the online and offline organizing of the Latino community in 2010 and beyond. You can listen to the interview here. Today we welcome Kety Esquivel, Executive Director and CEO of Latinos In Social Media (Latism). Kety Esquivel has over fifteen years of experience in the non-profit, private and political sectors. Her work has taken her to China and Ethiopia with the United Nations Economic Commission for Africa. She worked as the New Media Manager for NCLR (the National Council of La Raza). She is a graduate of Cornell University. She is a published author, world traveler and TV commentator. Her commentary has been featured and quoted in stories for the Wall Street Journal, CNN, Televisa and Univision. We will be discussing immigration and immigration reform and what we as a community can do to help! Join the discussion! Pictures from yesterday's immigration march, courtesy of my fiancé Richard McCarson. My Contributions to the "Web Thinking Manifesto"
"So many people are now branding themselves as "social media experts" without the proper experience. I learned first-hand during my time at National Council of La Raza that organizations need to be clear what they are getting and what they need. Digital natives are not just people who say they are. And orgs should avoid devaluing the position or the space by hiring people with entry-level experience to do mission-critical or senior-level work." To read their full white paper go here. In 2006 the Latino community took to the streets to protest the broken immigration system. In 2007 the Latino community registered to vote. In 2008 the Latino community voted. In 2009 the Latino community began to organize in our communities and online. In 2010 Latinos and their allies have mobilized online and off and are marching in Washington, DC to call for immigration reform. When campaigning for President, President Obama promised the Latino community that he was going to work on immigration reform. Over one year later, said promise remains unfulfilled and unanswered. Today one hundred thousand folks will be marching in Washington, DC to remind the president of his unfulfilled promise and urge him not to break it again in his second year in office. This effort is a complex and multi-faceted one, but one that needs to be tackled in earnest by our politicians who promised to do so when courting the Latino community for votes. We are waiting, watching and willing to hold those in elected office (in Congress and the White House) on both sides of the aisle accountable. Read more about the march and different efforts organized by folks here, here, here, here and here. Some links in Spanish can be found here and here. This last link has loud video so you may want to turn down the volume on your computer. 2-4 p.m. MARCH FOR AMERICA @ National Mall in Washington,D.C. March starts at 7th Street between Jefferson and Madison streets. The audience area will flow all the way back to 14th St between Jefferson and Madison. Note: Wear white shirts and bring American flags! You can see all 251 of the pictures here. 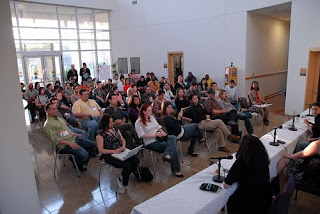 Thanks again SXSW, Latinos in Tech SXSWi team, panelists and LATISM familia for helping to make this happen! Earlier this month I was asked if I would participate in the Blacks in Techs panel at SXSW. Not being Black, I was curious why I was being asked to present. The organizers shared that their invitation was spurred by their desire to create a panel which would discuss issues that affect not only the Black community but also other communities of color like the Latino and Asian community. Given that context and being Latina, I accepted considering it an honor to be able to speak on a panel at Blacks in Tech in solidarity with amazing Black folks in tech at SXSW and the local Austin community. I was honored because I hold in high regard the opportunity presented by and the need for Black and Brown collaboration and was thrilled to be, in this small way, a part of that; and I was honored because the Black in Tech folks did over the course of their five year evolution at SXSW what I was hoping we could do with the Latino community this year and next. Moreover, the Latinos in Tech meet up at SXSW which is happening today was inspired in great part in my participation last year at SXSW and seeing what the folks at Blacks in Tech had done. So to me it seemed only logical to accept and say yes. The panel was phenomenal. The conversation rich. It spanned over one hour and while many people did not see the whole thing, it was great to be able to share it with those that did. One of my favorite parts of the panel was our focus on ensuring that we as communities of color be not only the consumers of technology but also the producers, the entrepreneurs, the leaders, the panelists, the speakers, the business owners and the investors. I am clear that this is the solution and I will be discussing this in further detail during my panel today at SXSW Future 15 at 3:30pm ACC Level 3 Room 9abc. It was in the midst of this that the controversial question was asked. Someone came to the microphone and asked why we (myself and one Asian panelists) were on the panel given the fact that we were not Black and this was a Blacks in Tech event. Having had this same question myself when first approached to speak, I did not take the question personally. I thought it was a valid one. The context of the question was as follows - given the fact that I and the Asian panelist were there, we were taking away an opportunity for two other talented Black folks in tech to be on the panel. Given the lack of representation of people of color, Black and Brown at conferences like SXSW I completely understand the spirit in which this question was asked and did not take it personally. However, I was very clear in my response that the reason I had accepted had not been to take away but to try to give back and contribute to a larger conversation of Black and Brown partnership and solidarity. That was the context in which I had been invited, as a Latina and that was the context in which I had accepted. Although I wasn't insulted by the question, other folks at the panel were. Several people walked out in the middle of the question. After the panel, several other folks came up to me en mass and apologized embarrassed by what had been said. One of the panelists drafted a blog post sharing his impression of what had happened: http://om.ly/gxP. 1- Communities of color need to work together in solidarity. 2- I am always honored to be a part of that when invited to do so in the spirit of partnership and collaboration. 3- There is a need for more opportunities to feature experts in tech from communities of color. At present conferences do not represent folks from our various communities on panels in a proportional way to our White counterparts. I am hopeful that next year SXSW and other conferences have many Black and Brown folks on panels not only as a part of a #LatinosinTech event or a #BlacksinTech event but in a way that is proportional to the numbers in which we exist nationally and internationally. 4- There is always not just one truth. My father's lessons from childhood when he taught me Aesop's fable about the elephant are as true now as ever. We are all blind men and women standing around the elephant and all of the pieces that we hold are true and yet none of them are true on its own individually. The elephant has a tail that resembles a rope. The elephant has an ear that resembles a fan. The elephant has legs which resemble tree trunks. And in the end it is in truth an elephant. I am hopeful that we can continue to work together within our own communities and between our communities to build power and continue to raise our voices individually and collectively to make this nation and the world a better place through tech. It is only together that we're going to be able to take on that elephant in the room. In a few hours I am heading to one of the biggest technology conferences of the year - SXSW Interactive. I was invited to speak at the conference last year and after my presentation was truly overwhelmed with the number of panels offered in the remaining days I spent in Austin, Texas. So this year, I am prepared. I anticipate drinking a lot of water, sleeping as much as I can (as I crash at one of my good friends homes) and squeezing in as many panels and quality time with thought leaders in the interactive field as humanly possible. Are you going to be there? If so, let's meet up! If you are on twitter, tweet me. My handle is @KetyE. I am speaking/participating in three sessions this year. The first is a panel organized by Jeffrey Bowman (a partner at Ogilvy & Mather's Consulting Practice) which is happening at the Blacks in Technology Meetup at the Carver Museum http://bit.ly/9gcu6E. It is open to both badge holders and locals without badges alike. My fellow panelists include musician and 'new media pioneer' Ryan Leslie; the founder of the digital strategic consulting firm Everywhere James Andrews; and blogger and social media maven Nichelle Stephens. The second session is happening at the conference itself. It is a part of the Interactive Future 15 Greater Good Series. The topic, "Is Technology the Great Equalizer?" http://bit.ly/bvFiYI. Its on Sunday, March 14 at 3:30 PM in room 9ABC at the convention center. This session is only for participants of SXSW (only open to folks with SXSWi badges). The third session is happening at the first ever Latinos in Technology Meetup at SXSW which I have organized with the help of Julie Diaz-Asper, Marisa Treviño, Deanne Cuellar, Maribel Lackey, Manuel Delgado, Fernando Labastida, Rob Garcia, Romeo and Armando Arayo. It is also on Sunday at 6pm. It is a panel at the Carver Museum http://bit.ly/9ffSbO which will be followed by a salsa social/networking event. Both badge holders and locals without badges are welcome. Dancing is not required, but encouraged. RSVP here: http://bit.ly/9ffSbO. If you are in Austin, Texas on these days, I hope to see you at one if not all three of these events! This video clip is from the "Intersection of Technology, Social Media and Government" panel I participated on at Gov 2.0 LA Camp with Erin Kotecki Vest (from BlogHer @queenofspain), Christine Lu (@christinelu) and Amanda Eamich (@amandare). Intersection of Technology, Social Media, + Government 2/7/2010 from Gov20LA on Vimeo.